The ABSA Business Day Supplier Development Awards, which recognises supplier development best practice in South Africa, is inviting organisations to enter their supplier development initiatives. The awards aim to showcase best practice and acknowledge successful supplier development programmes that are making a lasting impact on the South African economy. Entries close Friday, 1 March. 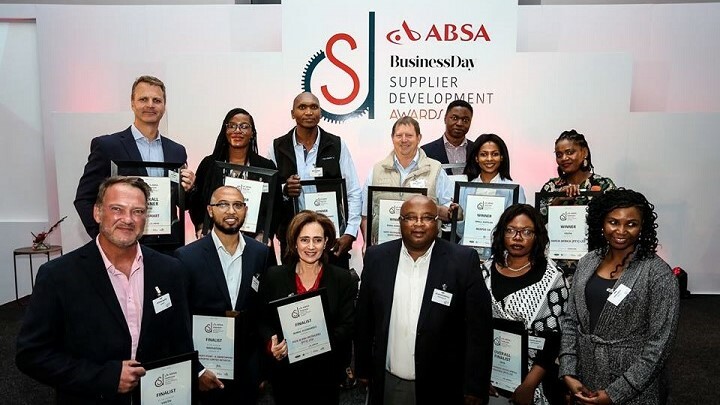 In 2018, Massmart was awarded as the Overall Winner at the 2018 ABSA Business Day Supplier Development Awards, which attracted more than 400 entries from both private and public sector enterprises. The October 2018 Supplier Development Benchmark Report, drafted by Fetola (which can be downloaded here at no cost), jointly conceived the Supplier Development Awards with Cold Press Media and Tiso Blackstar Group. "Overall, there was a widespread of industry representation, with professional services comprising 17%; community, social and personal services comprising 10%; and wholesale and retail trade comprising 7%. The largest category was ‘other/unspecified’ [36%], which is a reflection of the high number of SME and intermediary applicants whose industry falls outside the standard demographics," says Vusi Fele, chief procurement officer at ABSA. Fele says the importance of supplier development, particularly in the current South African context, should not be underestimated. "At ABSA, we believe that opening up opportunities for SMEs to access corporate supply and delivery chains is one of the most efficient and consistent ways in which established corporates can contribute to sustainable entrepreneurship development," adds Fele. The Newcomer Award: acknowledges companies that have recently initiated supplier development and shown merit in design thinking, innovation and commitment. The Nation-builder Award: acknowledges initiatives that are achieving exceptional results in supporting and growing non-traditional suppliers in one or more of the following areas: youth, black women, rural areas/areas with few alternative opportunities and scarce skills not readily available in South Africa. The Local Manufacturing and Small Supplier Award: acknowledges companies that have developed local manufacturing suppliers (LMS), small suppliers or value-add activities from the local industry. The Innovation Award: acknowledges companies whose innovative approach or ground-breaking methods and concepts are changing the game in supplier development and advancing local best practice. The Impact Award: acknowledges companies whose supplier development initiatives have impacted substantially on the value chain and are effective in the return on investment/efficiency of impact and/or scale of impact. The Overall Winner: acknowledges companies that stand out as overall leaders in the supplier development arena. Entries do not carry any costs for applicants and can be made by registering on the website. Winners of the ABSA Business Day Supplier Development Awards will be awarded at a breakfast event hosted by Tiso Blackstar Events on Wednesday, 22 May in Parktown, Johannesburg. The awards are presented in partnership with Fetola, Cold Press Media, and Tiso Blackstar Group. For more information, visit www.sdawards.co.za.